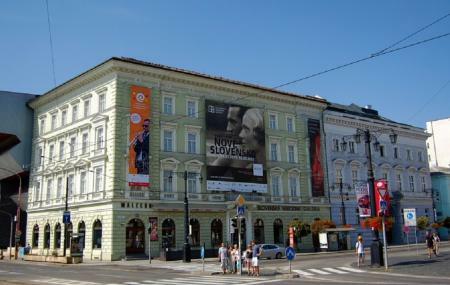 Slovak National Gallery showcases some of the best collections of modern and classic art in Bratislava. Not just a traditional gallery, you can often find guided tours arranged here along with workshops, seminars and educational programs for locals and tourists alike. When in the city, visit the national gallery to see art take shape and get familiar with its many interpretations and forms. If you love art, this one is simply a must! How popular is Slovak National Gallery? People normally club together Slovak National Theatre and Michael's Gate while planning their visit to Slovak National Gallery. Free entrance. Worth a glance, the gallery is ideally situated near the river and the old city. A few beautiful churchyards are only a couple of bus stops away. Nice gallery space across a number of floors. We saw the Useful Photography show which I enjoyed. They'd presented the work well and the selection was solid. There's a great cafe space downstairs which is very spacious and great to relax or meet a friend. Building doesn't look very pretty, but everything else absolutely perfect! All exhibitions are for free while they are renovating the building. Most of them really worth of visiting. You can’t knock free entrance. The small, makeshift gallery is humble, but very informative. The boards detail the finer points of art through the ages. It was more of an excellent art history literature experience than a appreciation of the pieces, which were excellent. I’m looking forward to the new gallery when it opens in a couple of years time.